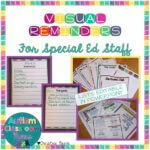 Many of you have asked questions recently about how to set up Independent Work Systems in special education classrooms. So, I thought I would take this month’s Workbasket Wednesday to show some examples of the way I’ve done it in the past. 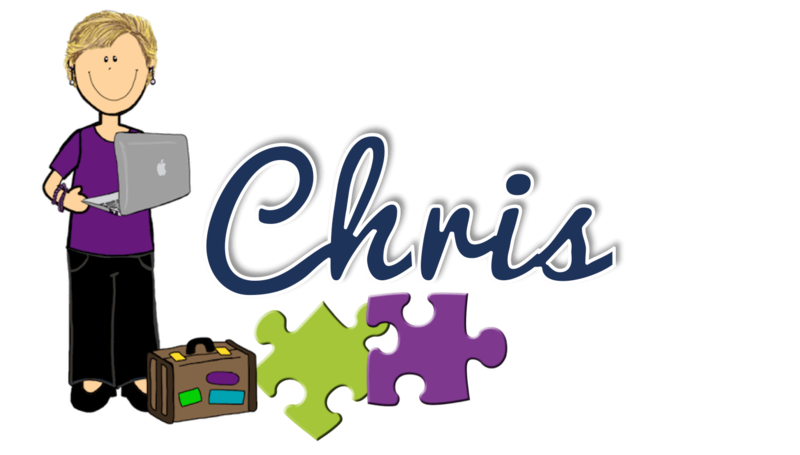 Later in July and in August I will talk about it again when I go into some detail about how I set up classrooms at the beginning of the year. 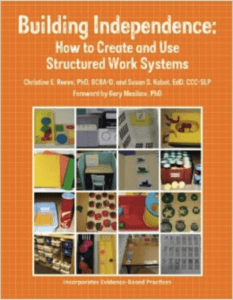 If you are unfamiliar with work systems, check out this post on What are Structured Work Systems for a full explanation. It also includes benefits of using them in the classroom. For important elements to remember in deciding how to set up a work system, check out the 10 Commandments of Structured Work Systems. The most relevant of these, as a refresher for all of us, is that workbaskets require tasks that the student has ALREADY mastered–they don’t teach new skills. The skill they teach is learning to work independently. Remember that by definition, you can’t do something independently if you don’t know how to do it. 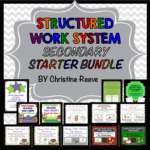 Independent work systems must only include mastered tasks. Also, tasks in work systems have to have a clear beginning and end–students have to know what they are expected to do and when they have finished. This means that tasks in work systems must be things that don’t require someone else reading directions, a teacher asking a question or anything that the student cannot do by himself (unless you are deliberately breaking that rule to teach an advanced skill). Work tasks must have a clear beginning and end. So, with that out of the way, let’s talk about some of the different ways that work systems might be set up. In many traditional Structured Teaching (TEACCH) classrooms, the teacher sets up a work system for each individual student. The teacher generally travels around to each student to provide direct instruction and they are working on work systems the other parts of the time. I’ve worked in classrooms set up this way but ran into a couple of issues with it. Most classes have 8-12 students or more and there often isn’t room for each student to have a whole work station of his/her own. 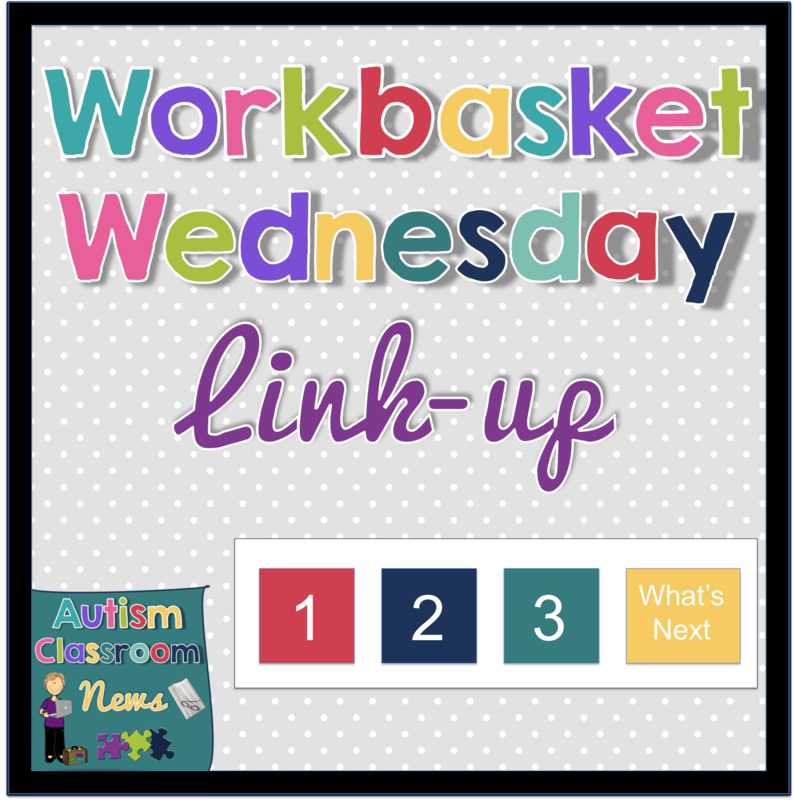 Storing the work baskets becomes difficult for multiple students to access them if they are not at the stage of independently retrieving the tasks on their own. Students don’t move much during the day and their environment doesn’t change. And my most critical concern is that students are being asked to work independently in the same place that they are working with an adult, which can be confusing. I like to keep teacher-directed instruction and independent work separate so students understand the different expectations. I like to keep teacher-directed instruction and independent work separate so students understand the different expectations. A 1-student work station center. 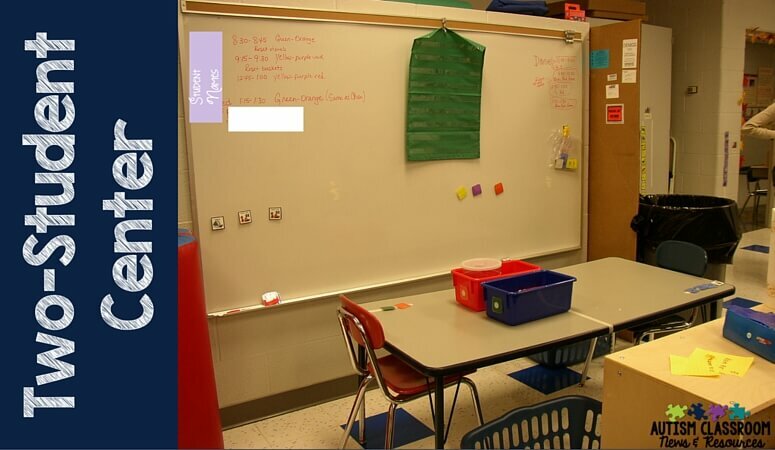 This classroom had students with significant needs and we had the staff to provide centers 1-1. We only had a round table to work with so we used masking tape to divide it off. For two students we would eventually put another station on the other side. In some schools I’ve worked in, the teacher had an extra classroom and was able to set up that classroom as a work system lab. This has worked out particularly well for students working on vocational skills. Essentially there was a vocational lab that included work systems as part of the rotations or that had only mastered vocational skills for students to practice on their own. Some teachers have tried to combine work systems with the students’ own personal desk area. This kills two birds with one stone when setting up the room. However, I have some of the same concerns with it as I do with the individual work station. First, I often put student desks in a group area where they are seated next to each other and we can hold group meetings. This means that there is little visual separation for work systems. 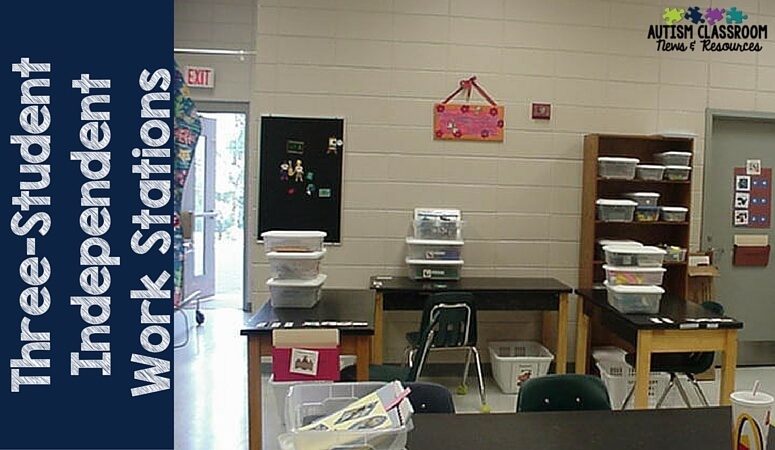 Student desks often don’t provide enough space for housing the baskets and materials needed for work systems. Again this is particularly difficult if the students aren’t able to independently retrieve and put away their own tasks. There is no room for a finished basket. Often the desk has more than one function so the cues for working independently are sometimes not as clear. Three independent work system center for middle school with the baskets stacked. Students face out from the center to reduce distractions. At the beginning of the year when I’m getting to know the students, it is easier to set up work systems as a center in the classroom. The students might rotate through the centers once or twice during the day depending on their needs. Sometimes I will have an academic center of work systems and a vocational or leisure set of work systems. Depending on the space in the room, these might be two separate areas of the room with different tasks, or they might be the same area with different in the areas. Within the center I set up 2 to 6 stations depending on how many I need for the number of students rotating through. 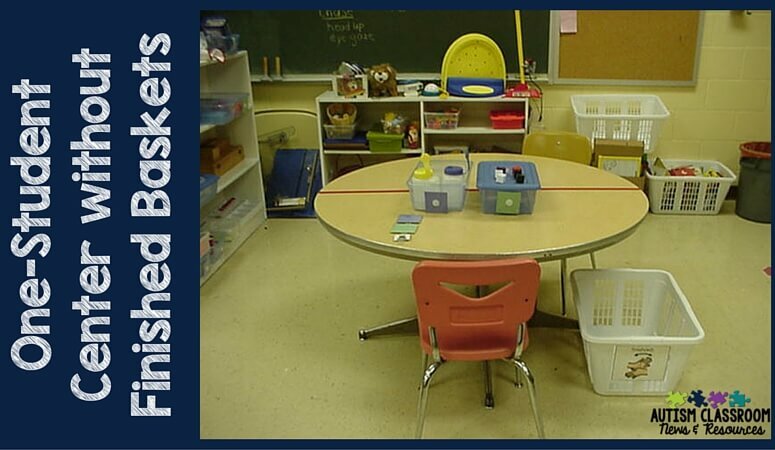 I might use individual desks or tables that I divide with masking tape to section off spaces. You can see some examples below. Students face each other and visual cues are left on the white board for the staff. Typically at the beginning of the year, as we get to know the students, we set up the systems with a high system and a low system or designated high, medium and low systems. Academic tasks or tasks that require more advanced skill, like packaging tasks, are put in the higher. 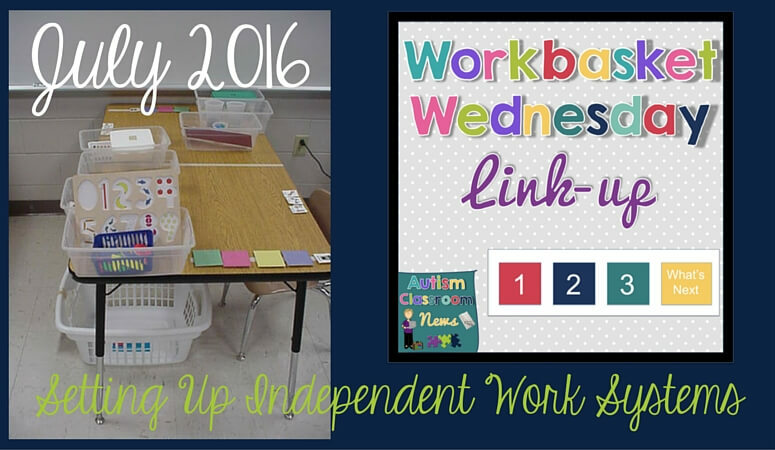 Low systems typically include simple put-in tasks with few pieces for students who are still working on independence. As the year goes on, we individualize the systems and keep track of the tasks the students can do independently. Then we can pull from that list to create the lesson plan and tell the staff member setting up the systems which tasks to pull for each system. Differentiate centers with space and visual cues for working with the teacher or staff on new material versus the expectation to work independently. Store the task materials in the area in which they are being used for easy access. Easily post visuals for staff and students designating which student is at which station and which tasks go in which station. Work with a variety of different types of furniture. Easily start out general and then become more specific as you get to know the students. Free up a staff member as students become more independent. These staff members can then help in another center or even add another center to the rotation (i.e., fewer kids in each place!). Hopefully this gives you some ideas to get started. As I wrote this I realized it really needed more detail than I had room for here. So I will be back on Sunday with an overview of how I set up center-based work systems step-by-step. Hi Chris! Great post. I just want to clarify- when you are first introducing the system to the students, you would have an adult there to support the student to learn how to use the space appropriately, correct? I am TEACCH trained and before starting my current position, my classroom had a work area for each student, so it was very easy to teach the system to the students, but that’s not how my program works now, and I found that most of my students never reached independence when completing the work system last year, and that was very frustrating. I want to figure out what went wrong so I can fix it for this year. Hi Lauren, yes you are correct. You would have to staff the center at first with someone to teach the system, starting with simple tasks and limited amounts of work followed by a reinforcer for completing the small part of the system you are requiring. Then fading out the prompts. You would definitely have to assign a staff member to teach the system, but eventually would like to fade that staff member out as the students become independent. Sometimes you have to get a bit creative with how you use the staff by staggering the students start on the systems to provide the prompting. Or you can put a more independent student with a less one so you can provide the teaching needed. I hope that helps! Hi Chris! I have a very severely handicapped class where most, if not all activities, are not only one-on-one but are hand-over-hand. By the end of the year, I was able to remove many physical prompts from most students and just give verbal with gestural prompts. However, they are still not ready for independent activities such as this, but I am dying for them to get there!! Would it be too much for them if I tried to set this up one day a week for the tasks that I know they can do with a gestural reminder? Basically many have mastered put-in tasks. With the others, I can continue doing HOH and fade prompts when I can using the same system? What are your thoughts? Or do you know of a better system I can use for my population? I have K-8 with most functioning at PreK and lower. Thanks!! I would say start with 1 simple put-in task and work toward independence completing it. For those who can do that, add in a simple schedule (e.g., match on picture, do the task, put it in the finished basket, check the schedule for the reinforcer). If they can’t do it independently, use prompts and fade them to teach the system. I would consider doing it daily so the students get more practice working independently since it’s such a critical skill for students you describe. Hope that helps. That’s a great question, Katherine. For me part of independent work is learning to complete your work within the time allotted. In a work system there is a reinforcer for work completion at the end of the schedule and that motivates the students to complete their work. I try to set it up so the amount of work in the systems is enough to keep them engaged but still finish with time for the reinforcer. However, there are still students who struggle wtih that. If I think it’s a motivation problem, then they learn that if they don’t get it done in time they don’t get the reinforcer. If it happens too often, I adjust the amount of work so they can be successful. So, I guess the short answer is that I have the students move on when the center is over and if they don’t finish, they don’t get the reinforcer. If that happens too much, I reduce the amount of work. Hope that helps!